I love the freshness of this salad for warm, summer days and the vibrant colours that it brings to the table. The fact that it is so easy to put together is an added bonus. Cook the soba noodles according to the instructions on the package. Be sure not to overcook them—they should only take 5 to 9 minutes, depending on the brand. Drain the noodles and rinse them under cold water. Transfer the noodles to a large bowl and toss them with a drizzle of extra-virgin olive oil (this prevents the noodles from sticking together). Prep vegetables - either julienned, spiralised or with a potato peeler. Add the courgettes, carrots, pepper, and cabbage into a large bowl. Toss with hands to combine and add the love! The dressing needs a little time to thicken, which it does on sitting. Pop all the ingredients in a mini processor (or simply whisk by hand). 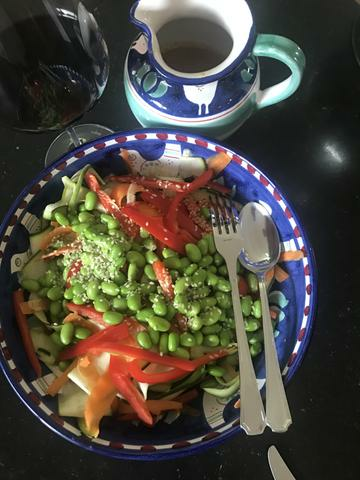 Top bowl with edamame, green onion, hemp seeds, and sesame seeds. For added protein, add some Tofu, grilled chicken marinated in herbs and lemon juice.